Due to reasons, I find myself with a spare copy of King of Scars, the new, anticipated novel from YA Superstar, Leigh Bardugo. This is the first in a new duology set in the Grishaverse and it is highly recommended you read the first two series first. 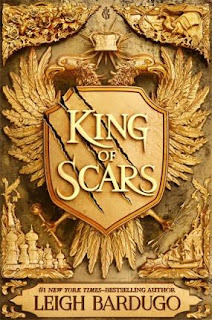 If you are a fan or want to start your collection, I am giving away my spare copy of King of Scars. You must be a resident of South Africa. You must follow me @urbanisedgeek on Instagram. Find the corresponding Instagram post and comment tagging 2 friends. Winner announced on Friday the 16th Feb 2019 on Instagram. Original content by UrbanisedGeek. Please do not copy without permission.. Ethereal theme. Theme images by jusant. Powered by Blogger.